Take Current Affairs quiz February 7, 2019 to enhance your General Awareness. Practice with our esteemed Current Affairs quiz February 7, 2019 questions which covers all important events across India as well as World. Make use of all important Current Affairs quiz February 7, 2019 questions with answers updated here, at free of cost to succeed in all competitive Exams and Interviews. SGS-1, Communication Satellite belongs to ________. Saudi Arabia announced the launch of its first satellite for communications, SGS-1, from the French Guiana Space Centre. When was the Pradhan Mantri Jan Arogya Yojana (PM-JAY) launched? Ayushman Bharat Yojana or Pradhan Mantri Jan Arogya Yojana (PM-JAY) is a centrally sponsored scheme. The scheme was launched in the year 2018 under the Ayushman Bharat Mission of MoHFW in the country. Cabinet has approved a unified authority to regulate all the financial services IFSC. What does IFSC stand for? IFSC stands for International Financial Services Centres. Under which Ministry does the Pradhan Mantri Jan Arogya Yojana (PM-JAY) function? Pradhan Mantri Jan Arogya Yojana (PM-JAY) functions under the Ministry of Health and Family Welfare. How much did the RBI impose penalty on the Syndicate Bank due to non-compliance with the directions? The Reserve Bank of India imposed a penalty of Rs.1 crore on Syndicate Bank due to non-compliance with the directions regarding frauds and risk management systems. What is the capital of Colombia? The capital of Colombia is Bogota. Who is appointed as the Ambassador of India to the Republic of Colombia? Ministry of External Affairs appointed Sanjiv Ranjan as the Ambassador of India to the Republic of Colombia. Which of the following fund is used for unexpected circumstance? The contingency fund is a fund for emergencies or unexpected outflows, mainly economic crises. How much deos the Centre demand the RBI to transfer from the contingency reserve? Recently, the Centre has demanded the RBI to transfer Rs. 27,330 crore from the contingency reserve. Pradeep Singh Kharola is appointed Civil Aviation secretary of Air India. Which bank UK chief honoured Freedom of the City of London? State Bank of India UK chief honoured Freedom of the City of London. Boeing 747-200 Air India's first ever Flight Simulator was exhibited in Nehru Science Centre. Which minister inaugurated Conference of State AYUSH Ministers in New Delhi? Are you looking for right place to enhance your Knowledge on Current Affairs of 7th February 2019 through effective Quiz section? 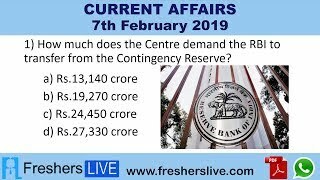 FreshersLive grants you the advantageous Current Affairs Quiz questions with accurate answers for 7th February 2019 which covers all the important events, supreme Awards, major occurrences in the National as well as World level. All important Current Affairs Quiz questions of 7th February 2019 are updated instantly in this page. Everyday at least 25+ Current Affairs Quiz Questions are displayed in this FreshersLive page. Correct Answer for each quiz question is given at the end of the entire 7th February 2019 Current Affairs Quiz questions section. You can estimate and upgrade your GK by attending these useful quiz questions. Entire quiz questions of 7th February 2019 Current Affairs covers Competitive Exam as well as Interview point of essentially important topics like International News, National News (ie. Indian Affairs), Science & Technology News, Environmental News, Bills & Acts Passed by Government, Defence News, About important Persons, Places, Banking & Economical News, Awards & Honours, Sports News, Revolutionary Updates on Arts & Culture, Obituary, Summits & Conference, Important Committee, Schemes, Appointments, Important Days & its Theme for Current as well as upcoming Year, Books & Its Authors, Agreements & MoUs, Budget, Taxes, Various Important Lists & Indexes, Visits by World Presidents, Prime Ministers, Political affairs and all Current Events. 7th February 2019 Current Affairs Quiz Questions updated in this page are prepared in the sense to help all aspirants to succeed in various Competitive Exams like UPSC IAS and other Civil Services Examination, Various Bank exams like IBPS PO, IBPS Clerk, SBI PO, SBI Clerk, RRB PO, RRB Assistant, Insurance exams like LIC AAO, UIIC Assistant, Railway Exams, Various Central Government Exams like SSC CGL, SSC CHSL, and more. Attempt all the Current Affairs Quiz Questions of 7th February 2019 and evaluate your score by matching your response with the correct answers mentioned at the end of this quiz questions section. By practising the FreshersLive Current Affairs Quiz Questions on a daily basis, you can surely succeed in the competitive exams as well as the interviews easily. Make use of this ultimate resource to the fullest and quickly achieve your goal!